The morning after our Intrepid Travels tour ended, our wonderful friend-guide-driver Subhash picked us up and whisked us away to northern India. 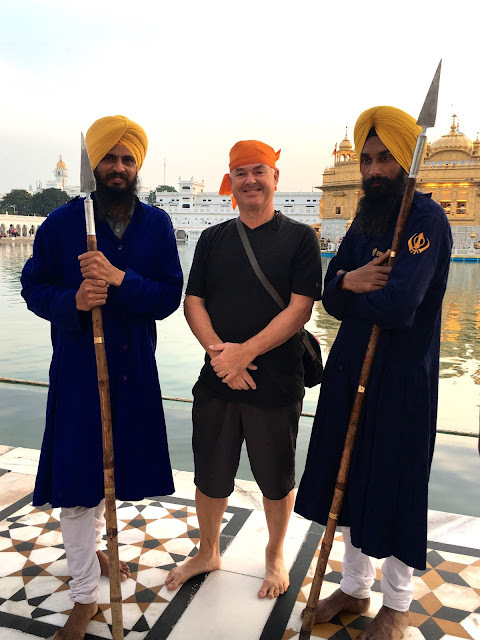 We were off to visit the Golden Temple in Amritsar and to witness the Wagah Ceremony at the Pakistani border. On our way north, Subhash noticed a Sikh wedding reception happening. "Would you like to stop in and see it?" he asked. "Sure!" we replied. The security guard gave us permission to enter. We were approached by a big burly man who introduced himself as a friend of the groom. We became his guests. We later learned he was a very important police inspector in the district. The next thing we knew, we were drinking whiskey with the police inspector in his SUV. At his insistence, we had three strong drinks in very quick succession. Those drinks gave Joe the liquid courage to get up and dance with the inspector in front of 500 wedding guests. The banghra dancers seemed to really enjoy Joe's performance. We bid our adieus after their dance and continued on to our destination of Amritsar and the Golden Temple. 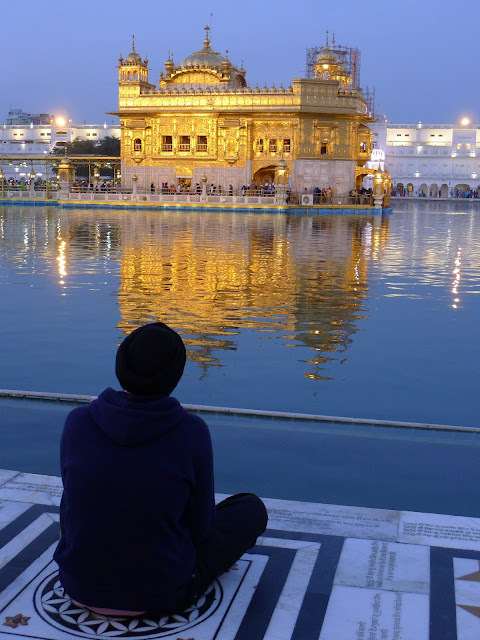 The Golden Temple was a beautiful and tranquil place to be. Many people bathe in the holy waters that surround the Golden Temple. Every Sikh temple has a kitchen and serves food free of charge. The Golden Temple feeds 100,000 people per day! We joined in for lunch. Sitting cross-legged on the floor and bending over to eat with one's right hand was not so easy for me. But I did it! Even though the Golden Temple was packed with worshippers, it had a peaceful and serene energy. The line-up was huge to enter the Golden Temple so we took a pass. We'll pop in next time! We enjoyed our time there so much during the day, we returned in the evening. The next day we visited the memorial Jallianwalla Bagh, a leafy park where 1,650 rounds were fired by the British Army into a crowd protesting the Rowlatt Act in 1919. Thousands were massacred. These Amritsari men asked for their photo to be taken. Selling sugar cane juice on the streets of Amritsar. Now that is what I call a juicer! 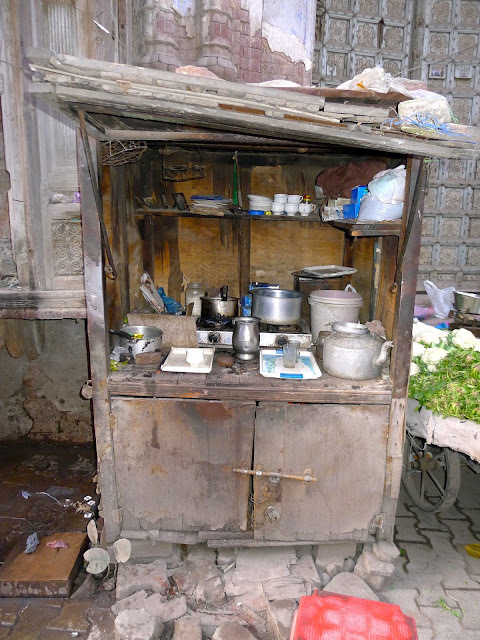 A local tea stall in Amritsar. This man is pulling naan out of the restaurant's tandoor oven. Guess who wants to build an oven at our house? Subhash introduced us to 'kadai milk', a hot milk drink topped with cardamom. DELICIOUS! The next day we drove north to the Pakistani border to witness the 'Beat And Retreat' ceremony. We arrived at the border early so we thought we'd pull off the highway and find a place for some masala chai. Subhash asked a man standing in a nearby field if it was okay to park there. The man said, "Of course." We got to talking and told him we were from Canada. Guess what? He lived for several years in Ontario! He insisted we follow him to his house to meet his wife and son. We spent an extremely pleasant hour drinking tea and eating biscuits in his 250 year old castle!! Turns out he is the 7th generation of an Attari family of land-owners and businessmen. After our visit, he insisted on escorting us to the border and park in one his many lots for free. His parting words were, "I love Canada and Canadians." Well, Harpreet, we love Indians! Waiting for the Beat and Retreat Ceremony at the Pakistani border. The next morning we left Amristsar bright and early for a long day of driving. We made a few stops along the way. Once we got to Delhi, Subhash generously invited us to stay overnight with his family. We gladly accepted his kind offer. We really wanted to meet his family! Punjabi breakast at a 'dhaba' (a highway canteen). We stopped for tea in the afternoon and met some sheep. Cow patties drying in the sun. The orange seller asked for a photo when we stopped to buy fruit at the side of the highway. Here is the best family in all of India. Subhash's family welcomed Joe and I into their home with open arms and loving hearts. His wife Anju cooked us a fabulous dinner, his mother Angoori was sweet and his children Shivani, Deepanshu and Jatin were incredibly polite, kind and attentive to our every need. The upstairs neighbours invited us for tea in the afternoon and then for breakfast the next morning! All too soon it was time to say good-bye to the best family in all of India. I think the cow was even sad to see us go. After plenty of hugs and kisses all around, we hopped into Subhash's car and headed for Vrindavan to spend a couple of days celebrating the festival of Holi. "Anything Is Possible In India, Ma'am."